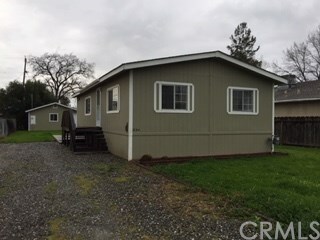 VERY NICE 2 BEDROOM, 2 BATHROOM MANUFACTURED HOME WITH A NEWER 2 CAR GARAGE WITH ALLEY ACCESS ON A 7500 SQ. FOOT LOT. the house has been well cared for it has a permanent foundation and a elevation certificate. kitchen and living room are all in one with a eating bar and dining area, nice open feel. There is a separate washer dryer room and that is the 2nd exit. The master bedroom is large with a big shower/tub combo. It comes with a stove and refrigerator move in ready. Check it out.